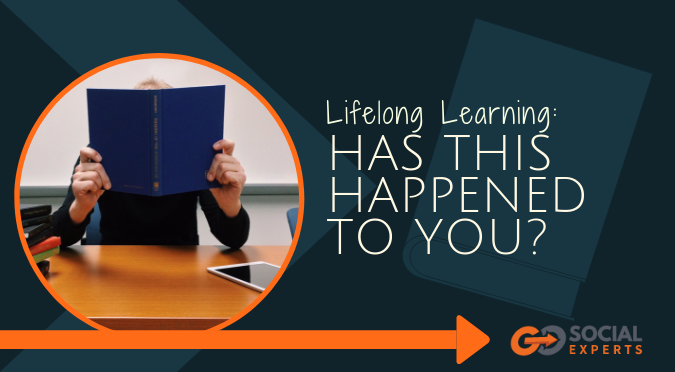 Lifelong Learning: Has this happened to you? A few months back I had an extra book on a topic that I knew could help one of my clients and I offered it to her. Her reply was that she never reads books and when she needs to know something, she Googles it. My thought at the time was how do you know what to Google? After all, every project we start or modify may require skills we don’t know that we need. For example, some of you may not realize that there is a process that has been defined that takes someone from I’ve never heard of you to here’s my credit card please take my money. When you follow it step by step your results improve. Did you know that when you’re preparing a talk there is a structure to the presentation that is more likely to move people to action than others? That to have a successful event there are certain activities that must happen in order for the event to succeed? That there are stages that every team goes through as they come together and if you know and plan for it you can create a stronger team faster? Every topic you take for granted has more depth than you realize when you look at it from an outside perspective? How do you find out what you don’t know before you need to know it? That is why having reliable sources of information that you go to regularly can improve your results. It’s the secret of successful people – lifelong learning. Now, they may read blogs regularly or books or magazines or attend events or talk to experts, but they have a way to get new information. How do you get new information? I find myself returning to 3 blogs every week and at least one podcast, and I read at least a book a month and I attend live events and I’m a member of 2 mastermind groups. This keeps me on top of what’s happening and connected to others who can help me. Now with all of this, I need to filter out the information I can use right now and information I may use in the future. I have been guilty of trying to do implement more than I can and getting overwhelmed. I do have filtering in place now, so my shiny object syndrome is mostly held in check. At the last event, I attended I did move forward with a new program for Go Social Experts clients. I’ve been looking for something like this for some time. I’m busy putting it in place for Go Social Experts and soon I’ll have it ready to share with you. How do you find out what you don’t know you don’t know? If you have a good answer to these questions, it will set you on the path to improved results. P.S. For an in-depth look at a complete Facebook marketing system looks like, sign up for my FREE Masterclass on Facebook marketing: Go Social Experts Facebook Marketing Masterclass. This Free class is a 5-day video course with a video each day, which goes into detail about each of the five steps for creating a profitable Facebook marketing machine.